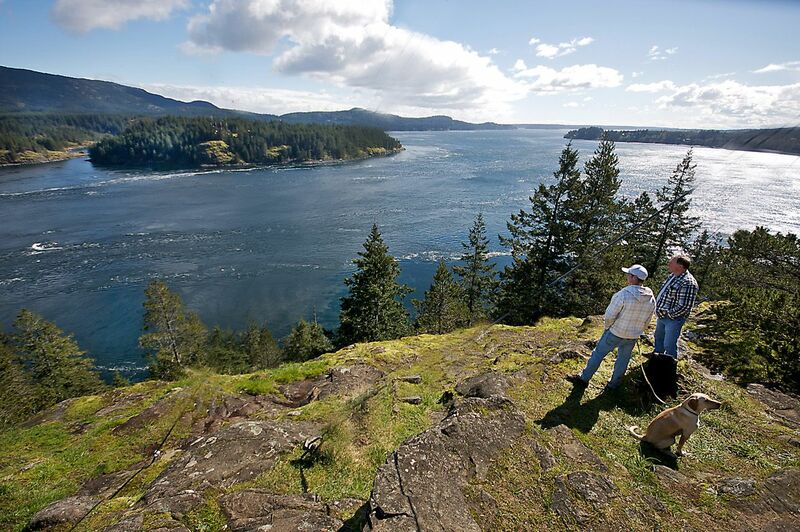 When you feel the need to lace up your hiking boots, B.C.’s southern west coast is the place to be. There are a wide variety of scenic trails, ranging from easy day hikes to challenging multi-day treks that meander along the ocean, plunge into lush rain forests or plop hikers on top of a mountain with dramatic, mind-blowing views. 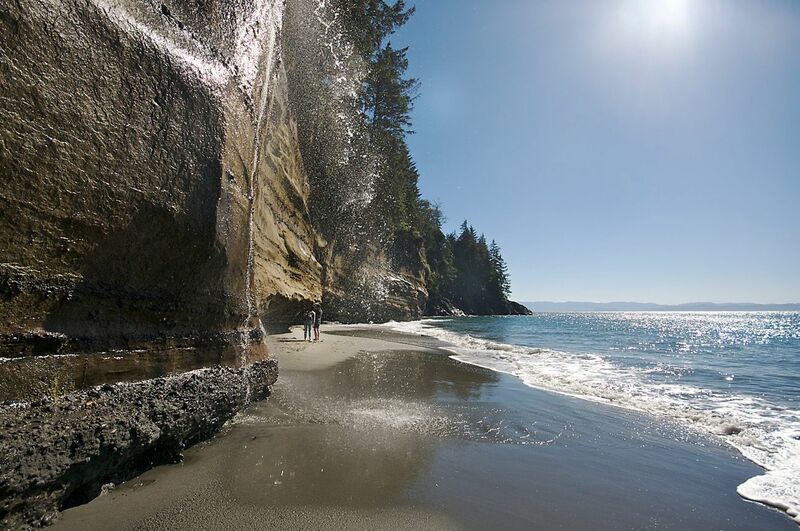 Here are some of the finest hikes on Vancouver Island and around Vancouver. 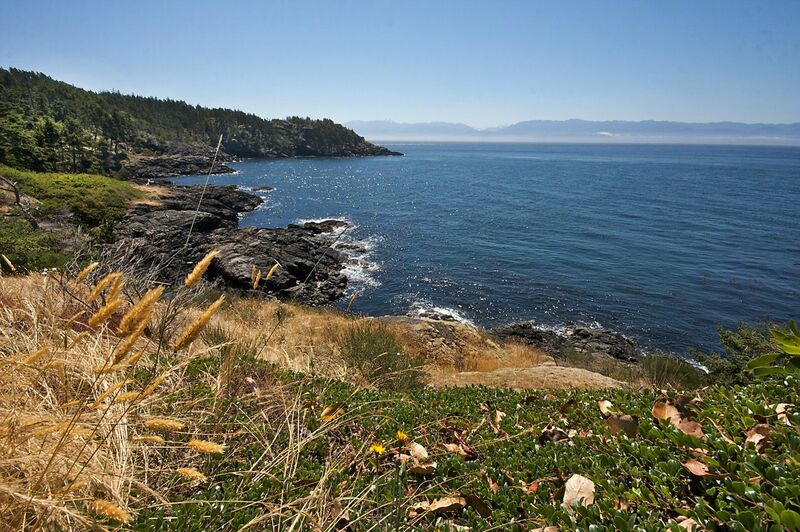 Considered one of the best day hikes in Canada, the Coast Trail in East Sooke Park can be challenging even for an experienced hiker, but the constant views of the snow-capped Olympic Mountains across the Strait of Juan de Fuca take your mind off the roller coaster of ups and downs across exposed rocks with windswept pines. The trail begins at either Aylard Farm on the south end of the park or Pike Road at the north end, which usually has less people and involves a 20-minute hike through the forest to reach the rugged shoreline. At times, the rough and winding trail hugs the side of small cliffs, then plunges into a dark forest with moss-covered trees and endless rows of ferns in a lush ravine. It’s hard to resist discovering what’s around the next corner. If you’ve never heard of the West Coast Trail, then you may want to question your existence as a hiker. Located on the Island’s rugged west coast, the world-renowned trek is considered by some to be the most challenging in North America. The trail starts in the logging/fishing village of Port Renfrew and runs north through Pacific Rim National Park to Bamfield, traversing through wild and remote coastal areas. You’ll spend five to seven days ascending and descending dozens of ladders (some 30 feet high), crossing rivers and streams bridged by massive trees, traversing canyons in a cable car, and camping on pristine beaches under the stars. A new third entrance has now been added at Nitinaht, allowing hikers to do half the trail. A permit is needed through Parks Canada to do the popular hike. Book well in advance since there are a limited number of spaces available and the trail is only open from May 1 to Sept. 30. If hiking for five to seven days through rugged and remote coastal terrain doesn’t sound like your idea of a good time, then you may want to consider doing the much shorter Juan de Fuca Marine Trail. Often referred to as a practice run for the West Coast Trail, the Juan de Fuca Marine Trail stretches 47 km (29 miles) along the southern coast of Vancouver Island from China Beach on the south end to Botanical Beach on the north end (near Port Renfrew), and takes three to four days to complete. This rugged wilderness trail mainly runs along the ocean, taking hikers on plenty of ups and downs through sections of rainforest, across suspension bridges, past waterfalls, grottos, interesting rock formations and beaches with tide pools. It is also accessible by car from several points along Highway 14, allowing hikers to do small sections if they prefer — or escape the trail if they’ve had enough. There are four designated trailheads at Botanical Beach, Parkinson Creek, Sombrio Beach and China Beach. Several campsites are also along the trail. If you want to see some big, gnarly trees that look like they’re from another world, then this is the place to come for a leisurely hike. Located 20 minutes from the village of Port Renfrew, Avatar Grove is a 50-hectare area that is now protected from clear-cut logging. The trail is divided into two sections: upper grove and lower grove, and can be a bit tough to find so keep an eye open for the small signs along the bumpy logging road. Wooden stairs and a boardwalk take hikers through an old growth forest filled with trees growing on trees, ferns, and massive Douglas Firs and Red Cedars — some with huge burls so twisted and contorted burls they look like something out of a fantasy. 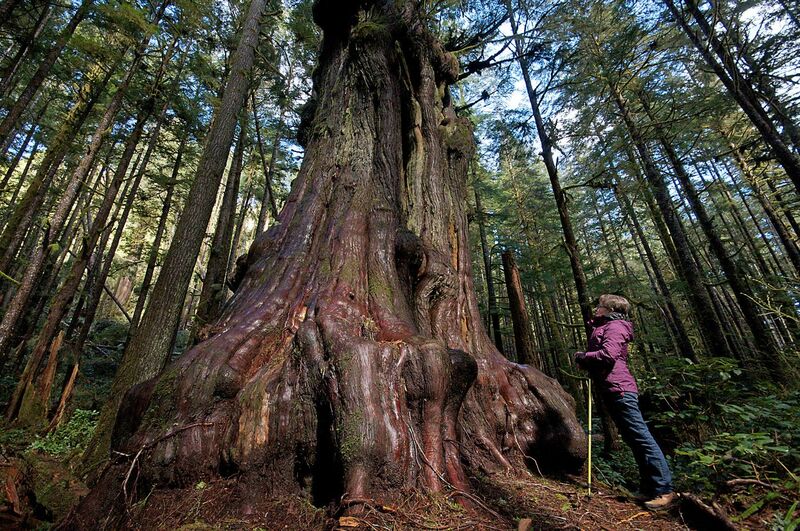 One tree has been dubbed Canada’s Gnarliest Tree. The towering trees are more than 500 years old. Some have a circumference of more than 40 feet. At 1,819 meters, Mount Arrowsmith is the highest mountain on southern Vancouver Island and comes with a number of challenging routes to choose from. The Judges Route is the quickest way to the summit, but it’s a steep slog with an elevation gain of about 1,000 meters, exposed sections and scrambles. 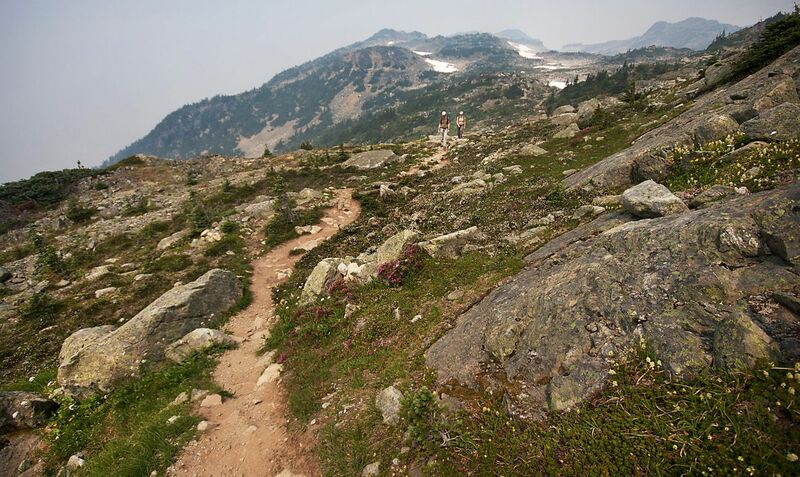 Another option is the Saddle Route, which is about 2 km (1.2 miles) with an elevation gain of 400 meters, and takes hikers onto the ridge connecting Mount Cokely and Mount Arrowsmith. The route to both trailheads is accessed by a logging road off Highway 4, and can be a bit tricky to find without a map, but there are a few signs to help along the way. Once on the trail, which is marked with ribbons, it doesn’t take long before the forest transforms into alpine shrubs, wildflowers, and large rock faces. The top offers 360 views of Vancouver Island and it’s mountainous interior. On a clear day, the Coast Mountains can be seen on the mainland. Ranked as one of the best attractions on Vancouver Island, it’s hard not to have high expectations before you step onto the Wild Pacific Trail. But don’t be intimidated by its name. Hugging the coastline of the Ucluth Peninsula, the well-developed trail is an easy, family-friendly walk that can be done in three sections: the Lighthouse Loop, Big Beach and Brown’s Beach to Ancient Cedars. The loops run almost entirely along the rocky shoreline, offering plenty of lookout points to stop and soak in the ocean views or watch storms roll in over the Pacific Ocean. The trails also take hikers close to the shoreline to experience the power of large ocean swells, onto rocky bluffs, through an array of twisted trees and into an old growth rainforest. Whales can be spotted most of the year, but are particularly active in March and April. It’s hard not to miss Lone Cone when you’re in the laid-back surfing town of Tofino on Vancouver Island’s west coast. At 742 meters, the cone-shaped mountain dramatically rises from the ocean in Clayoquot Sound, dominating the skyline of this picturesque region. 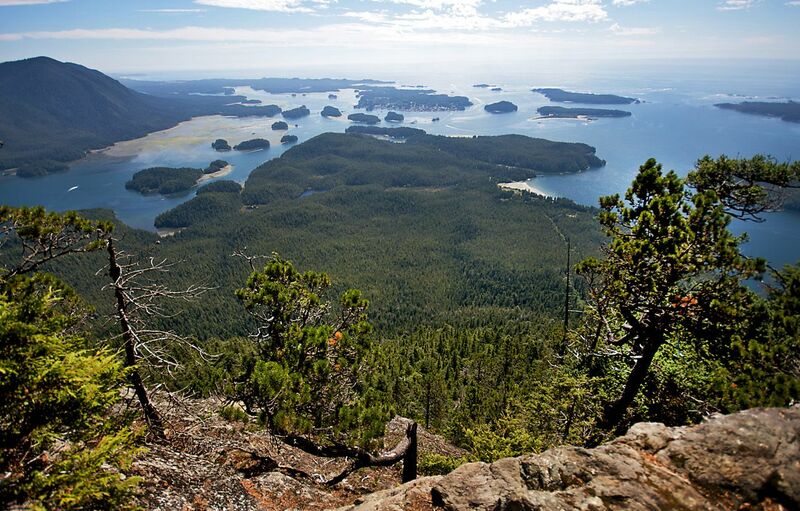 Located on Meares Island, getting to Lone Cone requires a water taxi service that takes about 15 minutes, and the hike to the summit is a strenuous one, with an elevation gain of 730 meters in 3.3 km (2 miles). The trail starts by winding through low-lying trees and shrubs, then opens to forests lined with dazzling green ferns and thick trees before turning into a steep climb straight up the mountain that never seems to end. But the spectacular views of the Pacific Ocean and surrounding islands coated in trees make up for the sweaty journey getting to the top. Found in the eastern sector of Strathcona Provincial Park, Mount Albert Edward is the sixth highest peak (2,093 meters) on Vancouver Island and one of the easiest mountains to get to. Accessed through the Mount Washington Nordic Lodge parking lot, the hike is best done in two or three days. The trail starts along the boardwalks running through Paradise Meadows, then eventually passes by a series of small lakes. A popular option is to spend the night at Circlet Lake, which is located about 10 km in, then make the push for the summit the next day. The biggest elevation gain is climbing up the lower part of a ridge near the lake, which is where the great views begin once above the tree line. The early part of the ridge provides the best views of Albert Edward and the small icefield below. Standing on the rocky ridge leading up to the summit feels like you’ve stepped into another world. If you are really ready to get away from it all, this is the hike for you. But getting to this rugged and remote wilderness trail takes a bit of effort. In order to reach the trail that runs along the west coast of Nootka island (located off the west coast of Vancouver Island), hikers must take either a floatplane or water taxi from Gold River. 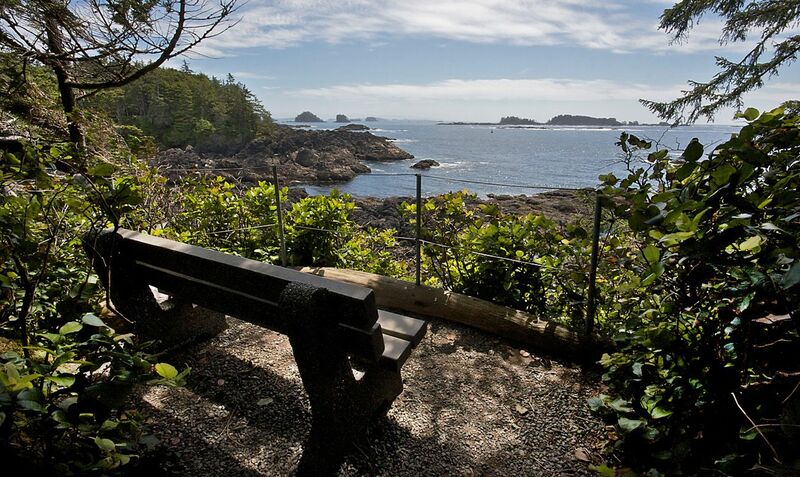 Most people do the trail from north to south, starting at Louie Bay and ending at the small community and historic site of Yuquot (Friendly Cove) —where Captain James Cook became the first European to set foot on B.C. in March 1778. Because of its remote location, there are few people on the trail, allowing more opportunities to see wildlife such as black bears, wolves, river otters and eagles. Most of the hike is done along the ocean on rock shelves, boulders and white sandy beaches, offering never-ending views of the impressive surf break that’s constantly battering the coast. One of the highlights is Calvin Falls where surf huts are hidden in the woods nearby. Located on the northern tip of Vancouver Island, the trails that run through Cape Scott Provincial Park take hikers off the beaten path. Like Nootka Island, coming here is an adventure into the wild to explore pristine rainforests, wide stretches of remote beaches and observe nature at its finest. The park offers more than 100 km of backcountry trails that range from easy day hikes to challenging multi-day treks. Following the route of an old telegraph line, the Cape Scott Trail is a classic trek for beginners and intermediate hikers, and takes five to six hours to reach Nels Bight, where many set up camp along the 2,400-metre long beach to explore the rest of the park and the Cape Scott Lighthouse. The remains of 19th-century Danish settlements can also be seen along the way. Those looking for a longer trip can hop onto the North Coast Trail — a 43 km (26 miles) extension to the original Cape Scott Trail. 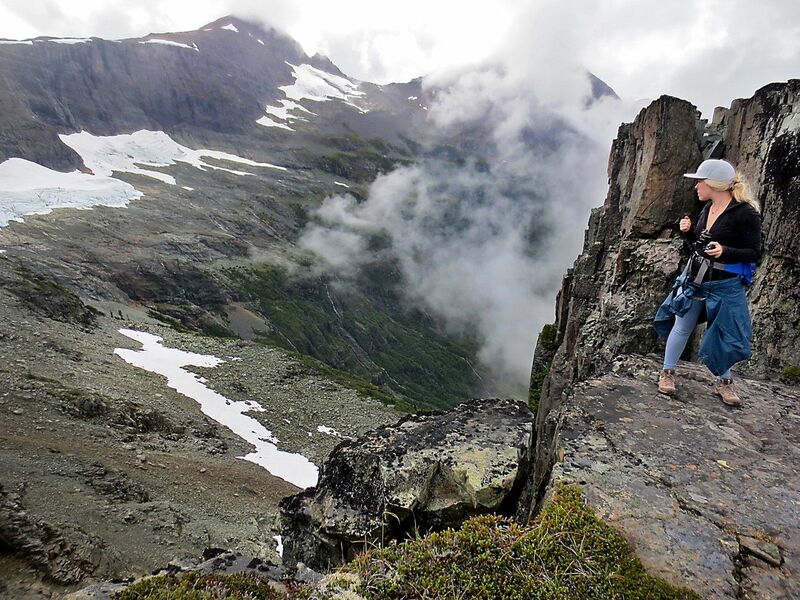 Known as one of the most challenging hikes in Canada, the total hiking distance is about 60 km (37 miles) and many sections require hikers to climb over or along fallen trees, cross deep mud and use fixed ropes to climb up and over steep sections. Compared to some of the other hikes found on Vancouver Island, the Ripple Rock trail isn’t all that exciting. But it’s the final destination that makes the short hike worth the time. Located 16 km (10 miles) north of Campbell River, the trail mainly meanders through the woods, offering a few viewpoints of Menzies Bay, then heads up a set of stairs to the bluffs overlooking Seymour Narrows — a treacherous pass less than a kilometer wide between Vancouver Island and Maud Island that once contained one of the most notorious marine hazards (an underwater mountain) in North America. In April 1958, the largest man-made, non-nuclear explosion in history occurred here, breaking up an estimated 370,000 tons of rock to make the pass safer. The viewpoint overlooks the location of the Ripple Rock explosion, where the water currents still churn at a dizzying pace, as large ships carefully pass through. As with some of the more challenging hikes on Vancouver Island, Della Falls takes a bit more effort to get to, but the reward at the end of the trail includes a waterfall 444 meters high, marking the highest falls in Canada. The trailhead is accessed by taking a boat or water taxi for 33 km across Grand Central Lake near the small city of Port Alberni. After that, it’s a 15 km hike up a gentle uphill slope most of the way to the base of the falls, which are at their best in mid-July. The trail mainly follows a creek that’s crossed several times on wooden bridges, metal bridges and a cable car. Wilderness camping is allowed in designated backcountry sites, and many hikers take a side trip to Love Lake. Getting there, however, is a strenuous journey with an elevation gain of just over 960 meters. It’s not very often you can stand on top of the world without having to put in much effort to get there, but the hiking trails on top of Whistler and Blackcomb Mountain, located an hour and 40 minutes north of Vancouver, do just that. In order to reach the High Note Trail, hikers can take the ski resort’s gondola up Whistler Mountain, then take a thrilling ride on the Peak Express chairlift, which hovers above walls of shale and ice. The trail initially wraps around the backside of the mountain, taking hikers through alpine meadows packed with colorful wildflowers at certain times of the year. On clear days, Cheakamus Lake can be seen far below, along with endless views of the Coast Mountains. The trail eventually loops back onto the resort side of the mountain, passing through an open rocky area known as the Sun Bowl, before making its way back to the gondola. For a real thrilling (and somewhat terrifying) experience, take the Peak 2 Peak gondola (the longest and highest lift in the world) to Blackcomb Mountain, where there are more hiking trails that take you to the top of the world. Don’t expect to find yourself alone very often when hiking through the backcountry of Garibaldi Provincial Park. Sitting on Vancouver’s doorstep, the park is often packed with people — and for good reason. 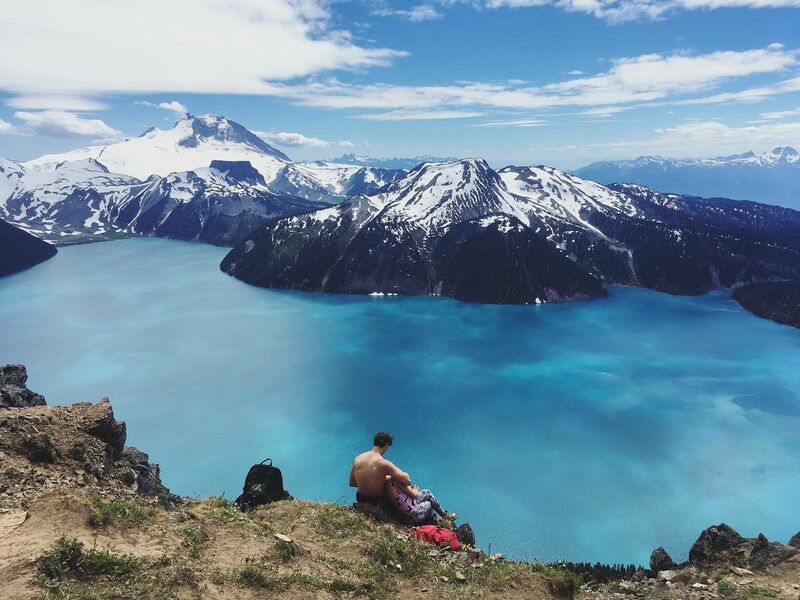 Offering more than 90 km (55 miles) of established hiking trails, the park is known for its glaciers, jagged mountain peaks and dazzling blue lakes such as Garibaldi Lake. One of the most spectacular hikes is the 30 km (18.6 mile) trail to Panorama Ridge, which offers stunning views difficult to match anywhere else. The trail begins at Rubble Creek (25 km south of Whistler Village), taking hikers through deep forests, meadows filled with flowers, across countless streams and to dozens of viewpoints that get more spectacular once reaching Taylor Meadows. The 1.5-km ridge is located high above Garibaldi Park with the dazzling blue lake far below. For those who want to stay overnight, there are several camping options in the valleys around the ridge. The trail to Joffre Lakes is definitely a well-beaten path, but it’s a great day hike for those who want to see some spectacular scenery without doing something too strenuous. 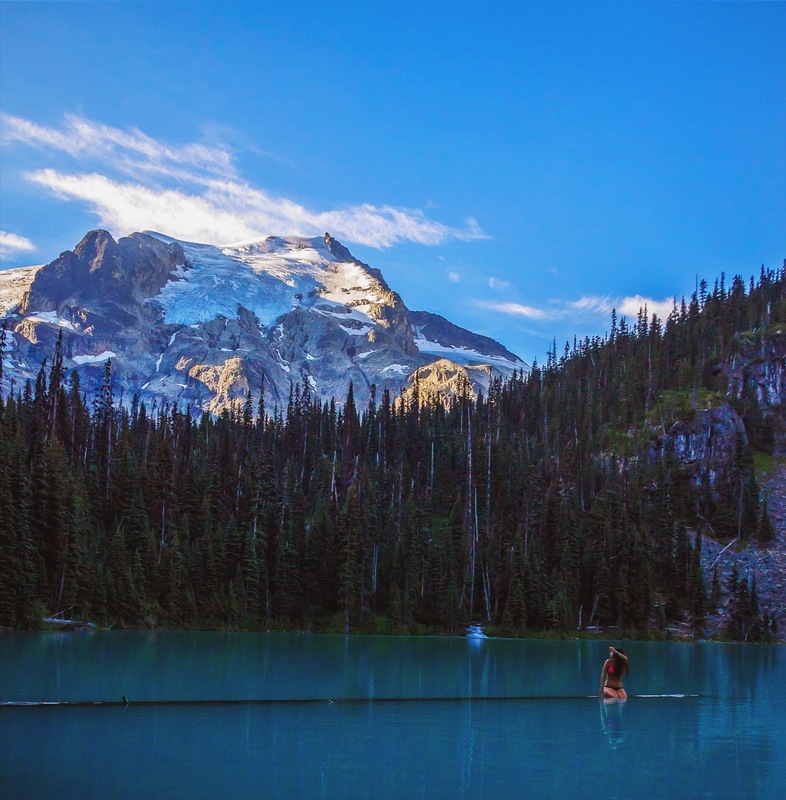 Located 20 km (12 miles) from the small town of Pemberton, the trail passes by three lakes; the second and third the most stunning with their turquoise blue water and views of the impressive Matier Glacier and Joffre Peak in the background. The first lake is only five minutes from the parking lot. The trail them ambles 5 km up a constant ascent through the forest before arriving at the second and third lake, which has a backcountry campground on the far end below the glacier area. The lakes get their dazzling color from “rockflour” — or glacial silt that’s suspended in the water and reflects green and blue wavelengths of sunlight. If you’re lucky, you can hear the thunderous crashing of ice as it calves from the glacier. Towering 702 meters above the Town of Squamish, it’s hard to miss the massive cliff face that’s one of North America’s largest granite monoliths. The trail to the top is a challenging one that goes straight up right from the start and it’s also one of the most popular hikes around Vancouver. The hike can be divided into three distinct summits — the First Peak, Second and Third. The First Peak is only 4 km (2.4 miles) round trip, but takes about two to three hours to complete due to the steep trail that has three cliffs on three sides with sprawling views of Howe Sound. The Second Peak is the largest of the three summits and has many places to soak in the views. The Third Peak is the highest. Chains and ladders are on First and Second Peak for some of the more technical parts of the trail. The two striking mountains known as The Lions can be seen from many locations throughout Vancouver — imagine what the views are like when standing near the top of them. The trail begins at either Cypress Bowl, just outside of the Cypress Mountain Ski Resort or at the end of Sunset Drive in Lions Bay. No matter what route you take, however, expect a challenging climb. On the route from Lions Bay, the trail climbs steadily through the forest, eventually ending up on a ridge that offers views of the West Lions. The last section of the trail is the steepest, involving a climb up a short gully, then a scramble to the top. Another ridge in this section offers a full view of both Lions’ peaks, along with stunning views of Howe Sound, Unnecessary Mountain and Vancouver.